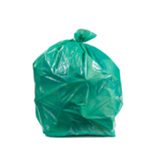 These medium strength high density garbage bags are 12 microns thick. In our humble opinions, High Density Polyethylene (nickname: HDPE) is pretty amazing stuff. To give you some perspective, a micron is a millionth of a meter: one human hair is 40 to 50 microns wide. So these wonderfully lightweight bags are amazingly thin, but still remarkably strong, able to carry loads of up to 50 lbs! 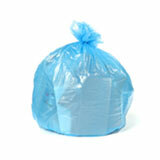 This means they handle wet trash with aplomb, so you’ll often find these waste basket liners in bathrooms. 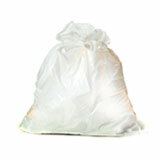 High density trash bags are a very economical choice. Because they use so much less plastic in the manufacturing process, these waste can liners cost a lot less to make. 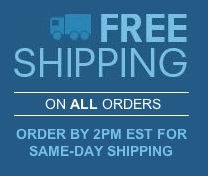 And because they weigh so little, they’re also cheaper to ship. That means a lot of savings, which we pass right onto you. 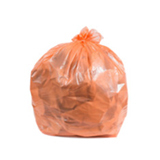 These bags are popular as commercial garbage can liners and recycling garbage bags, and fill both roles well, as long as you avoid filling them with sharp or pointy trash. People fill them up with paper or plastic drink bottles at the office, or use them to sort linens and clothes, either at the laundry or at home. 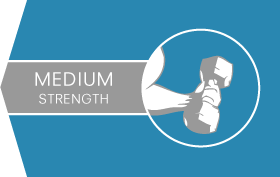 While they’re quite strong, they can be prone to punctures. 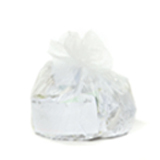 At this weight we offer you a choice of clear trash bags, so you can see exactly what’s inside, or black garbage bags, if you’d rather hide it from view. 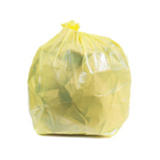 Wholesale trash bags are an effortless way to save money, whether you’re managing a household budget or a huge corporate one. You pay so much less per bag with bulk garbage can liners, and you spend a lot less time restocking when you run out. 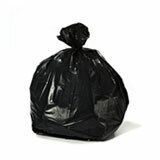 Plastic Place has done everything we can to make ordering wholesale garbage bags a snap. 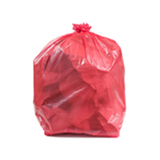 Use our handy filters to narrow down your choices to a perfectly fitting trash bag. If you have any questions, just get in touch, and we’ll share our friendly, expert opinion. 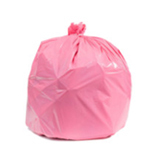 We ship your bulk trash bags out out on the day you place your order, and we stand behind our bags with a 100% satisfaction guarantee.